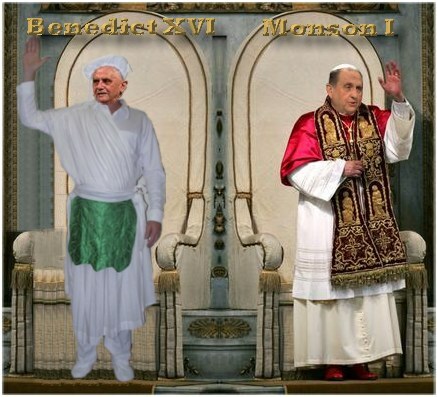 Add your own captions to "Monson and the Pope" in the text box below. Demonstrating an extreme ecumenical act of Christian co-operaton Thomas S. Monson and Pope Benedict XVI exchange holy robes. Benedict: With this cap and apron I look more like a cook, a servant. Tom, with this sort of dress you cannot command respect from a 10 figure congregation like the Catholics! At the most an 8 figure, like the Mormons. Benedict: Those of you considering conversion to Mormonism, consider the crazy outfit you will be forced to wear to worship their god! Benedict: This is sooo humiliating! Benedict: So is this how you make the sign? Benedict: Dear Lord the Mormons have no sense of fashion! Benedict: Remember Tom, I get my ring back when this is over! Monson: Rats, nuts, and crap, Ratzinger--this garb of yours is giving me jock itch. Benedict: So Tom when are we going to make the donuts? Why am I wearing fake tobacco leaves around my waist? Benedict: I'll show you my holy robes if you'll show me yours. Monson: Okay, Benny, but you go first. Post your comments in this text box or submit an image to: lookalikes at salamandersociety dot com.